Madfinger Games announced today a new third person action game for Tablets and Smartphones. The game is called Shadowgun and looks mind-blowing. Madfinger claims that they have created the most advanced handheld game in the market and from what we’ve seen so far, we have to agree with them. 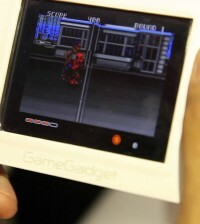 And on top of that, Shadowgun will support Android mobile devices powered by the NVIDIA Tegra super chip. If you thought that Infinity Blade looked great, wait till you see the game’s version that is powered by the Tegra chip. According to the company’s press release, Shadowgun will combine tactical combat with third person action. Players will take the role of John Slade, a professional bounty hunter in the year 2350, as he tries to hunt down Dr. Edgar Simon. We should note that the story has been written by Micah Nathan, so it should be quite interesting (for a handheld game).